Dr. Patricia Dorn, a distinguished parasitological professor in The Department of Biological Sciences at Loyola University and in partnership with Kids For World Health, gave presentations to Larchmont and Mamaroneck students. 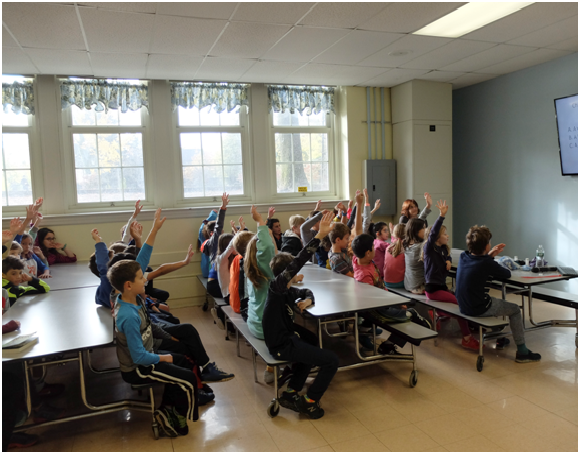 Dr. Dorn spent the entire morning on November 8th with the fourth and fifth graders at Murray Avenue School. Many of the students at Murray are members of a KFWH chapter. Ms. Linda Finn and Ms. Carole Moroney, who are chapter leaders, organized the Murray Avenue morning visit. In the afternoon, Dr. Dorn visited Mamaroneck Avenue Elementary School. 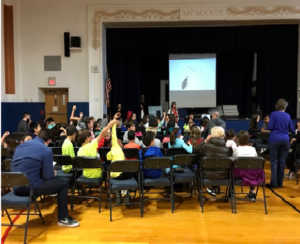 She presented her slide show to the entire fifth grade of over one hundred students, on the Eco-Health approach that helps villagers in Guatemala to help eliminate Chagas disease. Ms. Donna Shore took charge of planning the event. 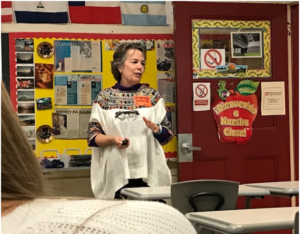 On November 9th, Dr. Dorn visited Ms. DeSilva-Lisa’s advanced Spanish class at Mamaroneck High School. Dr. Dorn spoke in Spanish as she described her unique and remarkable work through a visual presentation of village life in Guatemala. That same afternoon, Dr. Dorn presented another slide show to Ms. O’Reilly’s Biology, Anatomy, and ELL class. When students saw the images of poverty and parasite infestations along with the process of improvement, their empathetic responses led them to come up with ways that they could also help. Students and teachers appreciated Dr. Dorn coming all the way from New Orleans to meet them. Everyone was extremely interested in learning about her work and experiences in Guatemala. Her presentations, discussions, and question & answer time motivated all the students. They were eager to participate. Dr. Dorn brought the tools she uses and evidence of her work for hands-on sharing. This included: preserved “kissing bugs,” headlamps (which she uses in dark caves and houses,) Incaparina, a nutritional packet given to women who undergo treatment for Chagas disease, tweezers used to capture bugs, protective gloves, and vials that hold the bugs for further research. 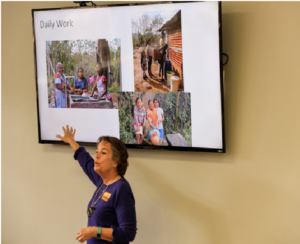 KFWH is privileged to enter into a partnership that supports her project in Jutiapas, Guatemala and other adjacent villages, to help stop the spread of Chagas disease. For the past three years, the fourth and fifth grade chapter at Murray Avenue School voted to raise funds to provide nutritional packets, to resurface the house walls and to build chicken pens. 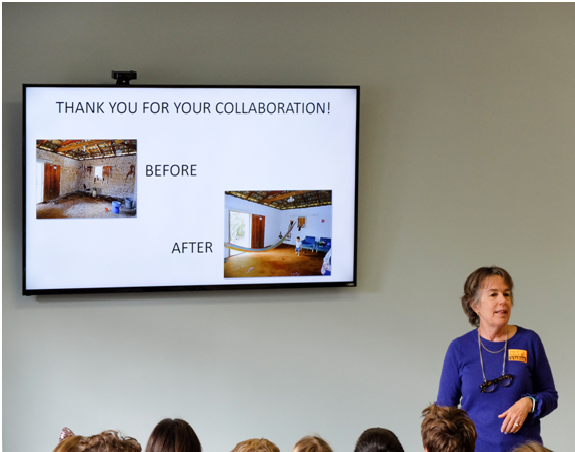 Here Dr. Dorn shows photographs of how the local houses are improved to prevent kissing bugs from hiding in the adobe cracks in the walls. The resurfacing of the walls and floors is done using all local materials and involves the collaboration of teams of workers including the local villagers. 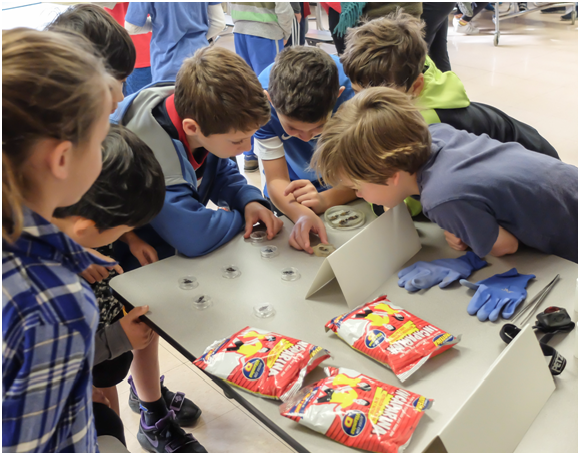 Students demonstrated their interest by the many thoughtful questions and the desire to help Dr. Dorn with her Eco-Health project. Many international groups support the Eco-Health approach around the world.